Getting a DUI is a difficult experience for anyone. Unfortunately, it doesn’t stop after you and the police officer part ways. On top of court dates, fines and jail time, you also have to worry about your suspended driver’s license. Once your license is suspended, the court will determine that you are officially a high-risk driver. Afterwards, there is a lot of hard work and paperwork between you and getting your license back. In the state of Florida, you will need to go through a number of steps to reinstate your driver’s license. In addition, you will need to become properly insured before you are legally permitted to drive again. If you’re caught driving without a valid license or without sufficient insurance, you are putting yourself at risk for additional charges and high fines. You may be scared, confused, and feeling lost in the aftermath of your DUI. The good news is that you can put it behind you. Today, our DUI defense attorneys are here to share 12 steps for you to follow in order for you to get your license back after a DUI. The first step to getting back into the good graces of the DMV is to make sure your mailing address is current. The DMV has online resources, but like many government offices, they tend to send paper documents through the mail rather than online. It is possible that your license has been suspended without you knowing it if you don’t keep up with your mail. Your mailbox is the primary way you will be getting information from the DMV about your license status. (Unless you go to talk to them in person.) This means that it is vital that you keep your mailing address current. Double-check your registration online and make sure that they have the home address you receive mail at right now. It’s all too easy to forget to update this information. Especially if you have recently moved. Whatever you do, do not risk driving with a suspended license; Don’t do it to get to work, to grab dinner at the end of the day. Do not drive on a suspended license unless it is truly a life-or-death level of emergency. Even then, you are putting yourself at risk. If you don’t want to significantly complicate and worsen your situation, it’s best if you refrain from driving entirely. Wait until you are certain that your driver’s license is valid or that you have a newly reinstated license. If you have been charged with a DUI and have not been told that your license is suspended, stay on the safe side and assume that it is. Getting your license reinstated after a suspension can happen quickly or after a set amount of time. It will depend on what the courts decided after your DUI. You’ll need to make alternative driving arrangements for the time being. This would be the time to experiment with public transport and join carpools. At first, you may be able to rely on rides from friends and family. But remember, goodwill and being your chauffeur is likely to wear thin after a few weeks. Have independent and alternate plans to make sure that you have a willing ride when you really need one. If you decide to try Florida public transportation, be sure to secure your belongings and keep your eyes open. Depending on the circumstances and your number of DUIs, you will most likely be required to get a high-risk insurance policy before your driver’s license can be reinstated. In some situations, this will be immediate and you will be able to drive again as soon as you have the correct insurance and filed the paperwork. In other situations, you will need to wait out your license suspension and then get high-risk insurance at the end of the suspension period. However, in Florida, you should generally expect to need to pay higher premiums for this specialty insurance package for 3 years before returning to normal insurance policies. 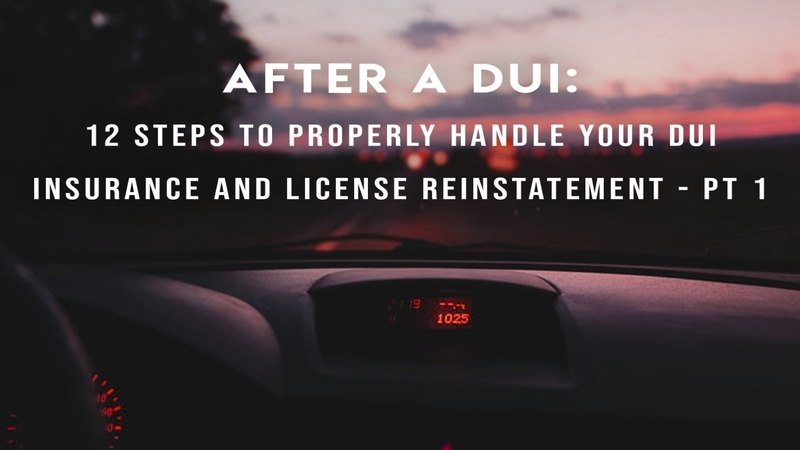 Stay tuned for Part 2 of this blog as we explain the remainder of the steps to take in order to get through your DUI. We’ll discuss SR-22 Forms, how to deal with additional insurance issues and any additional fees that you may encounter while getting back on your feet from your DUI. The most important thing to remember is that this is not the end of your world. It is one mistake that you’ll make in a lifetime full of them. To come out of this situation on the right side, contact our DUI defense attorneys at The Crash Lawyers. We’ll walk you through the process and offer any assistance that we can.